Social media has been flooding with random people getting strange faxes promoting PewdiePie’s channel amidst the subscriber fight against T-Series. 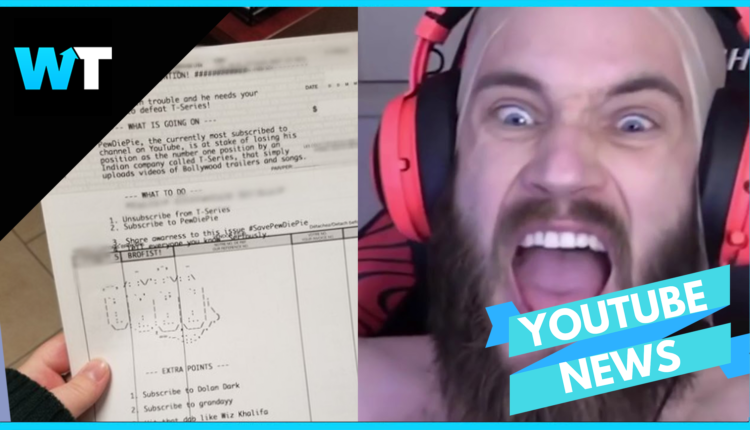 Social media has been flooding with random people getting strange faxes promoting PewdiePie’s channel. First things first, let’s unload that statement. Pewdiepie is the YouTuber who has reigned as the most-subscribed channel since August 15th 2013. Despite a small challenge from YouTube Spotlight, which dethroned him for 46 days in late 2013, Pewdiepie has maintained his top status since December 22, 2013. But now a mega Bollywood media company called T-Series is challenging that top spot. T-Series is a powerful music record label and film production company. Its YouTube channel shows mostly music videos and film trailers and has over 51 billion views and over 73 million subscribers. In addition, TSeries has a multi-channel network including 27 online properties. What’s most impressive, though is how quickly T-Series has gained followers. In 2018, the company gained over 50.3 million subscribers, bringing the channel extremely close to PewDiePie. But Pewdiepie and his subscribers are not going down without a fight. YouTuber and Pewdiepie fan MrBeast has been taking over billboards and creating marketing campaigns to bolster Pewdiepie’s subscriber base. But with Tseries closing in, another fan decided it was time for drastic measures. Though many were laughing at the prank, others took the hack seriously, especially when these faxes ended up in police stations. This raised a lot of concern about how safe a lot of fax machines really are, and though this is a hilarious prank to pull, Pewdiepie fans are very serious about keeping their favorite YouTuber at the top. Fans argue that the very fabric of YouTube’s essence will be altered if major companies dethrone independent creators and thus, the battle is not just about Pewdiepie, it’s about all of us.